Mumbai : Music is the language of the soul, espoused Spirit of India, a glorious musical evening held on 13th December by Chinmaya Mission Mumbai. The melodious evening set the tone for a week-long celebration, Chinmaya Ananda Utsav from December 13 to 20. 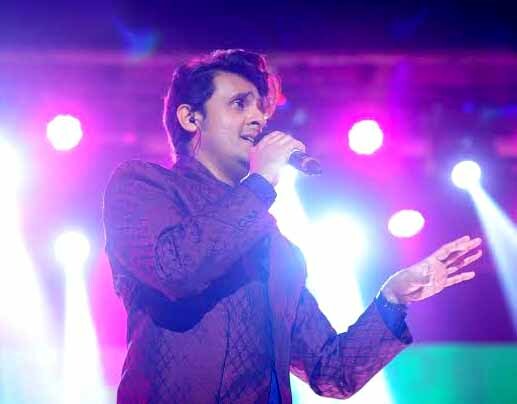 Sonu Nigam’s soulful musicals reverberated at the Sri Shanmukhananda Chandrasekarendra Saraswati Auditorium in the presence of an audience that represented India’s true diversity. True to its name, ‘Spirit of India’ proved to be a platform that unified under one roof - India’s youth, professionals, entrepreneurs, devout acharyas, members and trustees of various Chinmaya Mission Trusts, and luminaries of India’s business world..
Sonu Nigam’s musical renditions spanning a wide array of genres from pop bhajans, patriotic numbers, and traditional chants to some modern tunes echoed across the quintessential Shanmukhananda Hall and took everyone on an unparalleled spiritual voyage. Dedicated to Swami Chinmayananda, Spirit of India served to be a musical evening with a deep cause attached to it. The funds raised through the event will be utilized for conducting FREE workshops on “Transforming Indians to Transform India” for students in schools and colleges. The proceeds will also be used to offer Chinmaya Transformation Scholarships to deserving students for education and farmers’ relief in Maharashtra. “We are elated to see ‘Spirit of India’ shape up as a unique occasion where spirituality, music and patriotism came together to create an environment which could only be felt from the soul. For each one of us at the Chinmaya Mission, it was an endeavor to offer our heartfelt remembrances to Pujya Gurudev Swami Chinmayananda and mark the beginning of this special centenary year of his birth, while living his principles of unifying the nation through transforming every individual,” said Swami Swatmananda Acharya, Chinmaya Mission Mumbai. The year 2016 holds special significance for Chinmaya Mission as the birth centenary of the profound sage and founder of the mission – Swami Chinmayananda Saraswati who was born in 1916. To commemorate 100 years of his birth, the mission has meticulously planned a calendar of events and initiated a celebration spree across India to deepen the spiritual ties of all its devotees, followers and attendees. Eminent voices of the Mission put forth the plans for upcoming events scheduled for December including the Chinmaya Jyoti Yatra from 21 to 31 December. The evening culminated on a spiritual note in the presence of the Global head of Chinmaya Mission Swami Tejomayananda along with other dignitaries such as Rajashree Birla, Vibha Shangavi, Sonu Nigam, Mukul Patel – President of Chinmaya Mission Mumbai & Swami Swatmananda.